Pitching continued to dominate on Saturday night at John Euliano Park as No. 24 UCF recorded its second straight shutout of Savannah State in a 6-0 victory that clinched the weekend series. Sophomore left-hander Joe Sheridan got the start for UCF (3-3, 0-0 AAC) and was lights-out early on, carrying a no-hitter into the fifth inning. By the time his night was over, he had put together a second consecutive scoreless start. He allowed just four hits and one walk in six innings while striking out nine. The effort earned him his first victory of the 2018 campaign. Senior Eric Hepple and juniors Thad Ward and Bryce Tucker followed Sheridan’s six innings of work. The three relievers combined for six strikeouts over three innings to boost the staff’s total to 15 on the night. Offensively, UCF took some steps forward, racking up nine hits and drawing five walks to put together a six-run effort. Sophomore Rylan Thomas led the effort, delivering three hits in five at-bats. With those three hits, he raised his 2018 average up to .444. The offense has been sluggish to start this season, contributing to two 5-4 losses last weekend and a 1-0 loss at Stetson on Tuesday. The Knights got on the board early on Saturday night, picking up runs in the first and third innings. They later added two runs in the sixth and two more in the eighth. Alex Wright got the start for the Tigers (2-4, 0-0 MEAC), allowing two runs on three hits and five walks in five innings. He struck out eight hitters, but UCF’s ability to draw walks and move on the basepaths helped manufacture some runs. 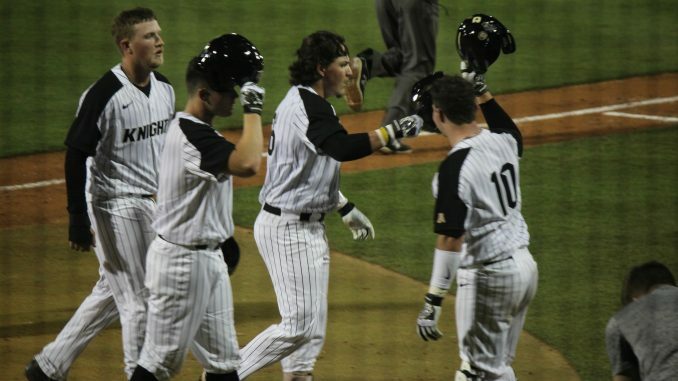 One night after stealing eight bases, the Knights picked up two more and took advantage of some wild pitches by the Savannah State pitching staff. The pitching staff was the story, though. UCF picked up back-to-back shutouts for the first time since 2006. Pitching has certainly been the catalyst the last two nights as the team bounced back from a three-game losing streak. It’s still early in the season, but the rebound is encouraging for the Knights. UCF will look for a three-game sweep of Savannah State on Sunday at 1 p.m. Junior right-hander Jordan Spicer (0-0, 3.60 ERA) will get the start on the mound for the Knights.